Hiring a carpenter to build a custom closet can cost several thousand dollars. If you are not in a place to have a custom closet built, consider modifying a store bought one. In the latest Domino issue, there is a fantastic article on transforming an IKEA Pax wardrobe into a very custom looking beauty. It is a great example on how good design does not have to be expensive. Paint and hardware can make such a big impact. 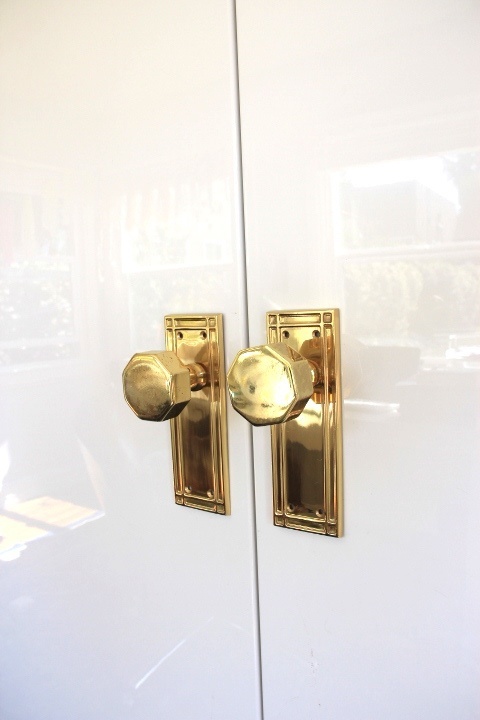 Jen Ramos of Made by Girl, added some glam with beautiful brass hardware and fun wallpaper to line her drawers. Here are some other great Pax wardrobes that have been modified to look custom. Pax with overlays on the doors.